If it ain’t a pleasure, it ain’t a poem. Fun is a medicinal bath, the culture industry never fails to prescribe it. Fun is no problem. Prescription is problem. Who controls the fun controls the measure. SEIZE THE ENDS OF LEISURE! I welcome this poet’s image as a little piece of experimental folly, like a virtual grain of hashish without which it is impossible to enter into the reign of the imagination. Experimental folly is ontological resistance. If there is hope, it lies in the poems. The poet rises at 08:00 one morning. The poet sits down at a computer. The poet commences automatic writing for 16 solid hours. Toilet visits of up to 5 minutes are permitted on the hour. that the poet may eat. a key being struck, the work is void. At 00:00, the poet goes to bed. The results are published unedited as a book entitled ‘Day’. I decided to upload this poem, found in one of my shopping receipts last December, for posterity. Not that it will do much good, posterity being rarely apocalypse-proof. Having said that, I also thought it fit to include a gloss to the poem written collaboratively with friends on Facebook. Names have been redacted to protect the frivolous. Through subtle manipulation of variables, online translation programs elaborate and enigmatize poetic truths. A poem is an activity, seeking to become itself. This song is the activity that you want to be. Here’s something that you want to use music in its operation. Here is what you want in their activity. This is what you want in the conduct of their activity. ‘After a long period of maturation in largely ignored circles, the basic elements of a new game are now appearing. Whether these elements are complementary or hostile, only time will tell.’ Asger Jorn, Pataphysics: A Religion in the Making, 1961. ‘Pataphysics is the science of imaginary solutions. Jorn describes it as a new religion that dare not speak its own name, for to be recognised as such is to recognise a constant equivalent and to authoritise, which is non-‘pataphysical. So to play the ‘new game’ one must embrace the certainty of total uncertainty, and bask in art and the absurd, which is all that can exist in such a state. Fifty years after Jorn’s argument, however, and we are still none the wiser about how this game might progress. Indeed, many might argue we are locked in a stalemate, or ‘game’s a bogey’. But not this scientist. 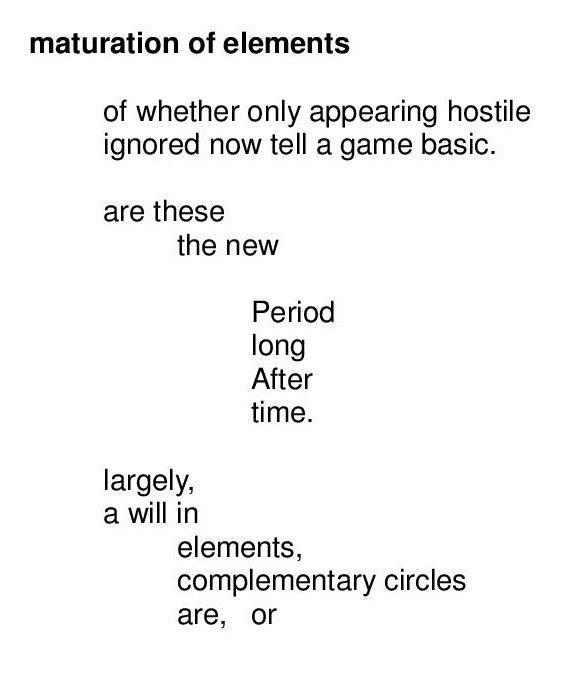 Through playing with the ‘basic elements’ of two games, using Jorn’s assertion as input data, it is the object of this poem to reveal some clues as to how present and future game activity might operate. The two games in question date roughly 50 years either side of Jorn’s paper, the former being refracted through the latter. First, of the historical avant-garde, is the dadaist poem method of Tristan Tzara. Rather than complete this process manually, however, the second game – of digital text manipulation – is engaged. That is, the dadafication process was completed by the multi-function procedural poetry machine JanusNode <janusnode.com>. The text was selected on impulse during a pleasure-read. It was swiped from UbuWeb <http://www.ubu.com/papers/jorn_pataphysics.html> and placed in the text editor of JanusNode. The Dadafy button was clicked once; manual tweaking of integers proceeded thereafter. Due to human error all data was lost during the tweaking process; it was reassembled from human memory with an estimated 90% success rate. Further tweaking took place thereafter, during which time the title emerged. After completion, the poem was sent to LibreOffice Writer for minor formatting, then printed and archived in .jpg, .pdf and .odt format. The entire tweaking process, including the reassembly from memory, took approximately one hour and ten minutes, inclusive of breaks for smokes, conversation, etc. The experimenter was pleased with the results, but the poem produced a muted response from his house-guest. It might be conjectured that this was due to the house-guest being otherwise occupied editing a dissertation on the work of Chilean writer Roberto Bolaño, and besides, he doesn’t understand advanced experimental poetry anyway. It may be true that these elements (whose nature remains unclear) only ever appear hostile to us but are not so, and we unjustly ignore them, but if they were to receive our attention they could show us the rules and structures of a grand game, perhaps known, perhaps novel, or the means by which that greatest game, life, may alter its operations. Certainly, the game is fundamental; it may be simple, or deceptively so. Might it be that these elements and their showings could be or reveal something genuinely new? A revelation of post-history? An allusion, surely, to the exponential rate of technological development in the contemporary world and the unfathomable effects it will have on human consciousness and relations, not least the manner by which time is perceived, if it be perceived at all! The poem looks forward to that glorious moment when human and artificial intelligence synthesize as one in what Ray Kurzweil has described as the Singularity. None can predict the outcome of this union. But in light of the ‘pataphysical/dadaistic mode in which this poem arrives encoded, it is clear that this state must encompass and reconstitute the aesthetic, social and metaphysical liberties of the great avant-gardes of the 20th century. Not only that, but the poetic moment itself, cherished by the avant-gardes, is as near to a prediction as we can get; it is the Singularity’s epiphenomenal analogue. So the elements of the poem, then, are dual, but tending (through maturation) towards the same: technology and poetry: Singularity. Well, one cannot sound too convincing, it’s uncouth. But there is will in these elements, human and not-human, it both is these elements and is surrounded by these elements, and it is willing, largely. And so the image of complementary circles, technology and poetry. They complement, because through the poetic we may imagine the Singularity, which through technology alone is unimaginable, and through technology we may achieve the Singularity, which through poetry alone is unachievable. But circles do not tessellate, and here the spatial metaphor breaks down, hinting at future possibilities of cognition and inviting us to guess what they may be, as these circles be simply and strangely, in a curious, isolated copula. And be, the poem tells us, they certainly will. Or, they might not. After all, it’s impossible to imagine a period after time, let alone long after time. This poem, like the rest of us, has no idea.